Nim Deathmantle SOM - Can return opponents creatures, missing "you control"
Hoden of infinite Rage CHK - The flavor text is cut off , missing the last line. Okina,Temple to the Grandfathers COK - The Flavor Text is cut off, word "Kamigawa" is missing. Spreading Plague INV - "Destroy all creatures" ( wrong), should be "Destroy all other creatures"
Kederekt Leviathan ALA - "Bounce all nonland permanents" ( wrong) , should be " bounce all other nonland permanents"
Volcano Imp PS - the word "creature" is in english , should be "criatura"
Chrome Mox MIR - Imprint exiles a nonland, nonartifact card ( implies from play) , missing the part "from your hand"
Rath's Edge NEM - missing the period at end of sentence. Wirewood Hivemaster LEG - On the FOIL version only the expansion symbol is zoomed in and cut off, all other LEG foils are correct. Scion of Vitu-Ghazi DMG - missing the word flying in textbox, The Bird token is not flying. Denizen of the Deep Xth - "Bounce all creatures" ( wrong) , should be "bounce all other creatures", missing the word "outras"
Loxodon Warhmmer MIR - Translation error, says: "Combat damage" instead of just "damage"
Myojin of Life's Web CoK Layout error: missing tab between 1st and 2nd text passage, other language versions and other portoguese myojin version have this correct. Acidic Slime FNM Promo text error: has word "entrar" twice in textbox, but missing the word "artefato"
Goblin Rock Sled 4th BB wrong word seperation "s-er"
have a White copyright instead of Black copyright,while all other red and white Homelands cards have a black copyright. Varolz the Scar Striped DGM Typo in Text Box: "mana" in reminder text is spelled "mara"
Genesis Wave SOM - text typo "gebrcht" instead "gebracht" , missing one "a"
Cultivate FNM Promo - Cartype Sorcery untranslated ,should be "Hexerei"
Souls Might ALA - grammar typo "Macht des Seele", should be "der"
Hunger of the Howlpack DAS - grammar typo "Hunger der Heulerrudels", should be "des"
Souls Majesty - grammar typo "Majestät des Seele",should be "der"
Necrotic sliver PS - says "sacrifice this creature: sacrifice a permament", the second sacrifice should be "destroy"
Unhallowed Pact AVA - typo ,says " ..bringe ihre Karte.." should be " .. bringe diese Karte..."
Earthquake 4th/3th WB - text typo ,One versions says" jeden" , the other is correct and says "jedem"
Garruks Horde M12+ Promo - Typo in Rules explanation Text "Zauebrspruch" instead of "Zauberspruch"
Deathrite shaman and Niv magus Elemental RTR - Both translate "Instant" wrong to "Sofortzauber", should be "Spontanzauber"
Wretched Banquet CON - text typo ,says " Kreatur Deine Wahl" ,should be "Kreatur Deiner Wahl"
Ornithopter 4th - is misspelled "Ornithropher"
Cackling Witch MM - Missing a space in textbox "Karteaus" should be "Karte aus"
Smallpox TS - Two grammatical errors in the flavour text: "Große Verlust" instead of "Große VerlustE" and "Um ein Opfer..., musst du IHN" instead of "es"
Stroke of Genius US - typo "EinE Spieler" instead of "Ein Spieler"
Johtull Wurm IA - Cardtype line says "summon wurm", was not translated, should be "Beschwörung eines Wurms" like on all other ice age creature cards. Arctix Foxes IceAge Has snow-covered landwalk, missing completly the part " ..with power greater than 1..."
Hipparion IceAge "Cant block creatures with power greater than 3......" missing the part "or equal to 3"
Scandalmonger MM - Typo, missing a letter in "wift" , it should be "wiRft"
Enslaved Scout AL Ver 2 - Typo , missing the last letter in the Rules Text "... Zuge" should be "... Zuges" , Version 1 is correct. Ajani, Mentor of Heroes JiN - Layout Error, The arrow of the 2nd ability points downwards, but should be upwards, since its a "plus" ability as the 1st one. Triton Tactics THS - Translation error, The "does not untap" part only affects creatures, that have been tapped by the spell, so already tapped ( by attacking) creatures are unaffected. Jaces Ingenuitiy Promo - The word "instant" is untranslated, should be "Spontanzauber"
Seize the Soul GP - Missing the complete first part of text: " Destroy target non black non white creature"
Burden of Guilt DarkAscension - has a "tap:" cost instead of "1:"
BloodGift Demon IN - wrong letter in Name "korowawago" ,should be "korowawogo"
Recollect RAV - ( Xth version is correct) Translation error: Can Target only "creature card" instead of "any card"
Sewer Dreg RAV - Translation error: Exiles only "creature card" instead of "any card"
Silhana Ledgewalker GPT - Translation error: The second passage says: "...cannot be target of spells or abilities OF CREATURES, your opponent controls"
Ghorclan Bloodscale GPT - Texterror: Missing the whole passage "Use this ability only once each turn." Pride of Lions - 7th,Duel Deck - The name is translated as "The pride of the lions" instead of "A group of lions"
Spineless Thug Salvat 2006 - On #31 the word "creature" is in english , version #18 and #19 are correct with "criatura"
have the artwork cut off, while on non foil and all other languages the artwork overlaps the picture frame. Priest of Gix US - Flavor text is in rules text font and not in italics. Woodland Druid OD - Flavor text is in rules text font and not in italics. Treefolk Mystic UL non foil has a very tiny copyright line fontsize, the foil one is correct ! Thopter Foundry ALR - activation cost "tap:" instead of "1:"
Kokusho the Evening Star CoK - In Textbox it is named wrong "Koshuko"
Noble Quarry BoG - "All creatures able to block Noble Quarry do so" missing the part "or enchanted creature"
Noble Purpose 8th ( Mercadian Masques version is correct) "Whenever a creature you control deals ( correct) or is dealt damage (wrong) ..."
Boil 8th - List a word twice in flavor text "seront seront"
Katabatic Winds MIR - List the wrong Artist "John Matson", should be "Gary Gianni"
Wind Shear MIR - List the wrong Artist "Gary Gianni", should be "John Matson"
Tymaret, the Murder King THEROS In 2nd text passage two letters are switched in name ->"Tyramet"
Minamo, School at Water's Edge CoK- Error in Name "Minamo, École la cascade" missing the word "de" in the name, which makes it "waterfall school" instead of "school at the waterfall"
Night of Souls' Betrayal CoK- "Trahison de la nuit des âmes" was translated wrong, it means "Betrayal of the night of souls"
Descend upon the Sinful SoI The name has a typo which changes the meaning. They use "Pêcheurs" (Fishermen)(wrong) instead of "Pécheurs" (The Sinful / Sinners)(correct) . Vial of Poison M14 - "Tap:" instead of "1:"
Sunflare Shaman MOR - error in rules text, missing completely the part "and deals X damage to itself"
Commander 2013 - All cards, which had no italian name before, had their name not translated, the english one is used instead. Pride of Lions 7th Name is wrong translated to "The Pride of the lions" instead of "Pride of lions"
Myojin of Life's Web CoK Layout error: missing tab between 2nd and 3rd text passage,all other language versions and other italian myojin version have this correct. Heartwood Treefolk Tempest Artist name typo "Daren Badger"
Legerdemain Tempest two typos in artist name "Darne Badger"
Thopter Foundry ALR The Tokens have no color,the textbox is missing the word "Blue"
Solkanar the Swamp King TS - textbox error: "...gain 1 life and gain 1 life." TIP Card MBS with Plague Myr on back - Missing the artist, has: Illust. "Artist Name" instead of Illust. "Efrem Palacio"
Poison Token MBS with Plague Myr on back - Missing the artist, has: Illust. "Artist Name" instead of Illust. "Efrem Palacio"
Higure the Still wind CHK - triggers on "damage" instead of "combat damage"
Repel Intruders SHM - counters any "spell" instead of just "creature spell"
Shared Animosity MOR - missing "until end of turn". The effect last for good. Utopia Vow PC - Has a typo in text and a double period at the end of textpassage two. Telim Tor Mirage (correct version exist)- missing last line of flavor text "Telim Tor"
Electrostatic Bolt Mirrodin (might not exist as Foil version,correct version exist) - The version from Darksteel Precon-Deck "Master Blaster" has an additional letter in flavor text last line. The affected cards : Elvish Mystic,Satyr Wayfinder,Shaman of Spring,Roaring Primadox. All Fate Reforged Mythics were printed wrong with the Foil layout on the non foil card. This is indicated by the Star(*) instead of Dot (.) in the copyright line.No corrected Version exist. All Fate Reforged Rares were printed wrong with the Foil layout on the non foil card. This is indicated by the Star(*) instead of Dot (.) in the copyright line. Additionally "Crux of Fate" and the 5 Sieges ( Outpost,Palace,Monastery,Citadel,Frontier) have the shading from the Foil Watermark printed on the non Foil cards as well. A correct Version of Monastery Siege exist, which was printed for the FRF Clash Pack. Divine Reckoning INN - I choose the creature for each player instead of each player choose for himself. Dead Ringers APO - Rules text meaning is inverse , destroy 2 target non black creatures, as long as one target is not a color the other target is. Wort Boggart Auntie LOR - The ability is missing "target". Hagra Diabolist ZEN - triggers from opponent allies as well, missing textpart "under your control"
Trait Doctring DGM - Texterror. Missing "until end of turn"
All japanese Legions cards have their expansion symbol significant moved to the right. The reason might be the many occurence of multiple creature types, which needed more space in that line. Japanese Shards of alara uses a different textbox font for foil and non foil cards, which affects only numbers. As a result each card with a number in the textbox ( ca 75 % of the set)has a different text layout in foil and non foil. Tomorrow , Azami's Familiar SOK - The cardname is wrong translated to " Tomorrow, Azusa's Familiar". Azusa and Azami are both different Legends from that set. All six M15 Foil Planeswalkers in s-chinese are missing the number in their Loyality Box. The nonfoil and the t-chinese versions are correct. Almost all t-chinese Onslaught cards, which have an instance of +X/+Y (X,Y=0,1,2,3,4,5,6,7,8...) in their textbox, have the "Y" number overwritten by a chinese letter. On very few cards this layout error was corrected before printing and on some cards the +X/+Y fits the end of a text line, so the layout error is less obvious. 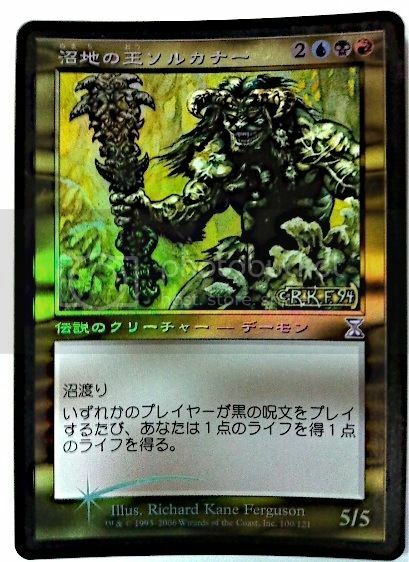 Ashiok ,Nightmare Weaver TH - Functional error, the first ability is "+1" but should be "+2"
Kjeldoran Dead 5th - Name was translated wrong to "Kjeldoran Lion"
Nissa Worldwaker M15 - Two translation errors. 1st Ability : "Land becomes 4/4 until end of turn"(wrong), should be just "Land becomes 4/4"
and 3rd Ability: "Put lands into play tapped"(wrong), should be untapped. Eldrazi Scion Token #003 OGW The name at the top is extremely dark,printed black on black and the token will appear nameless if you dont look very closely. Tempest of Light Xth - Flavor Text ".. may takeS its course" should be "take"
Wits End M13 - Flavor Text "patheitc" instead of "pathetic"
Granny's Payback UNH Arena Promo - The Artist name is wrong, "Kaja Folio" instead of "Kaja Foglio"
Elixir of Immortality M11 - allows you to shuffle a card you do not own into your library, was in later sets corrected to " its owners library"
Monarch Token Conspiracy2 missing a word in textbox: "... beginning (of) your end step.."
Last edited by mmgun on Mon Sep 05, 2016 4:43 pm, edited 21 times in total. Feel free to post other mistakes you found, which are not listed at squts page. Its hard to figure those out today. mmgun wrote: Feel free to post other mistakes you found, which are not listed at squts page. Thanks. I do own some not listed, will add them later, as I need to go through my Misprint binders. It says, "Swampwalk Whenever a player plays a black spell, you gain 1 life and gain 1 life." Nice find, those japanese errors are really hard to figure out! Last edited by mmgun on Tue Oct 01, 2013 9:40 am, edited 5 times in total. mmgun wrote: Nice find, those japanese errors are really hard to figure out! More to come in Japanese...After Coffee Number 2 Then , you can add them to your list. The product of this is the official error that the topic as "? Ja I do become big at Tarmo" the card type is gone in the printing mistake. ※ It does not affect the size of Tarumogoifu. · "Polygnathus Zaurus / Gnathosaur" of Foil other than has been in a similar error. It is the official error of only Foil that says "meteor storm" is damage in the text field of this place. * The actual damage is a meteorite storm. "Meteor storm" you do not know even color without even from the dot does not mean damage. The product of this is the official error △ 2 mark is written in the text field only to Foil. * There is no impact on the effect of course. also shows the non foil Afflicted Deserter with the weird signs ( lets call it "Delta2") So it probably affects all versions. Your notes about Meteor Storm and Gnathosaur i dont understand, sorry. What did you put into your coffee ? The Gnathosaur should have the error with name = card type on all versions ( foil and non foil) . Is there another error with this card? I do not own these cards, I'm not a Google Translator, and I don't speak Japanese. All I know is that these cards are Misprints, now for a Japanese Member of this forum to explain and translate in a clear and better way. Actually i myself do not count those to "regular misprints". Imho this is not an error but just creativity ( or rather stupidity) of the translator. Probably the first translation used a less suitable word for a certain expression, therefore another expression was used later. There are so many examples for this, even listed somewhere here in the forum. For my collection i just care about those cards, that use different expressions for the cardname and there Reference to the cardname in the textbox, since this is a real mistake. Le Filet de corail ne peut enchanter qu'une créature verte ou blanche. The Foil Version misses the last part of the Text.